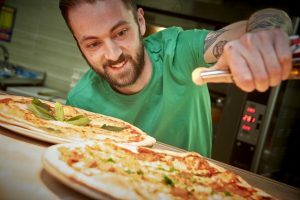 An independent brand has brought pizza but not as you know it to Hull’s fastest-growing dining location. 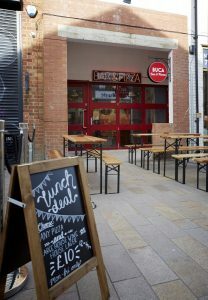 Buca di Pizza is the latest distinctive venue to open in the Fruit Market as the waterside district benefits from an ongoing wave of investment. 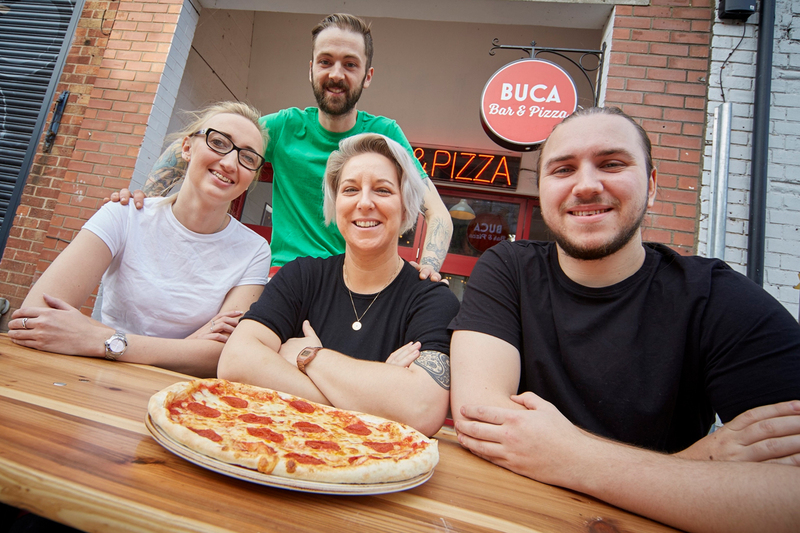 Buca di Pizza’s owners have invested £175,000 in fitting out the pizzeria and bar in Humber Street and the opening has created 15 full-time and part-time jobs. 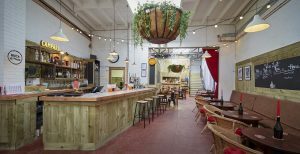 The 1,900 sq ft venue, converted from a former fruit and veg warehouse, has 80 covers inside, with the front of the venue arranged in relaxed bar style and the rear set out for more formal dining. Outside there is seating for up to a further 20 customers. Buca di Pizza – the name loosely translates as “the pizza pit” – is owned by brothers Geoff and Nick Thornton. Geoff Thornton said: “We’re really happy to be part of the great things happening in the Fruit Market and we’ve had a fantastic reception from customers. Lots of people have said we’ve brought another option and dimension to the choices already available. “Pizza is very social food and we feel we’ve created a great environment for a relaxed, casual dining experience or for people to enjoy a few drinks. “The building has some great features that give it a really special feel, from the sky lights that give the restaurant area so much natural light, to the tiled floor. We’ve taken these assets and added our own quirky style. Buca di Pizza offers a new dimension to classic Italian dining and has made its name by giving pizza an exciting and contemporary twist by using ingredients and flavours from around the world. As well as pizza staples such as Margherita and Quattro Stagioni, the menu in the Humber Street pizzeria includes Hickory Pig, featuring smoked cheese, pancetta and pulled pork, and Seafood of Mirth, with Goan curry sauce, mixed seafood, buffalo mozzarella, rocket and lime wedge. Every pizza is made with dough using the finest olive oil imported from Naples for a true taste of authenticity. Buca di Pizza’s house beer is Birra Mia, with Peroni and Aspall cider also on draught, with a selection of bottled beers and craft beers and a regularly-changing guest ale supplied by the Yorkshire Brewing Company in Humber Street. The selection of Italian wines is complemented by regional cocktails such as Limoncello Spritz and Veneto Sling. 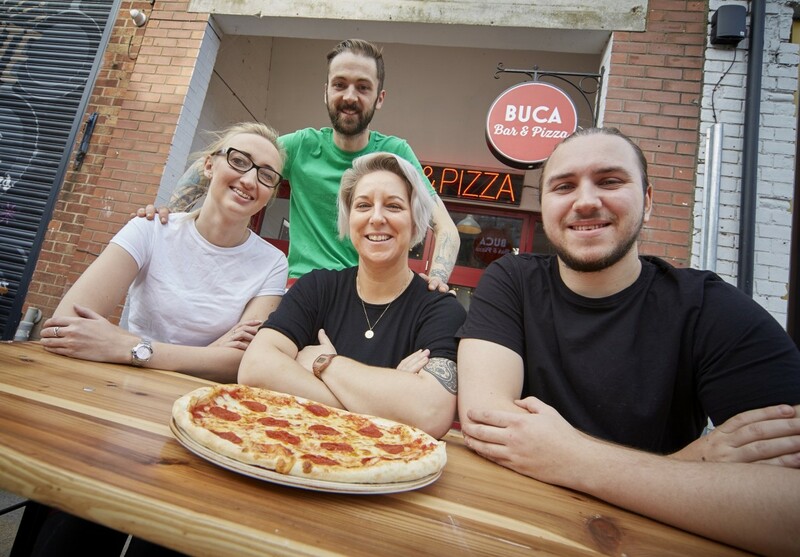 Buca di Pizza is the latest venue to open as part of the £80m transformation of the Fruit Market being delivered by Wykeland Beal, a joint venture company formed by regeneration company Wykeland Group and housebuilder Beal Homes, working in partnership with Hull City Council. The pizzeria’s opening follows the likes of high-quality restaurants Ambiente Tapas, Butler Whites and Tapasya @ Marina; artisan chocolatier Cocoa Chocolatier and Patisserie; arts venue Humber Street Gallery, which features a ground-floor café and rooftop bar; Humber Street Distillery Co gin bar; and vintage fashion brand Poorboy Boutique. Plans have also been announced for a £3.5m redevelopment in the heart of Humber Street, including a revamp of the pioneering Fruit venue. A planning application has been lodged for the repair and redevelopment of 61-63 Humber Street which houses Fruit, including the creation of a new, purpose-built and sound-proofed multi-arts performance venue. The building will be completely refurbished and regenerated to become a hub for the creative arts. The Fruit Market’s commercial opportunities will be complemented by 101 new mews-style homes around private courtyards, with ground works for the residential development due to begin before the end of the year. 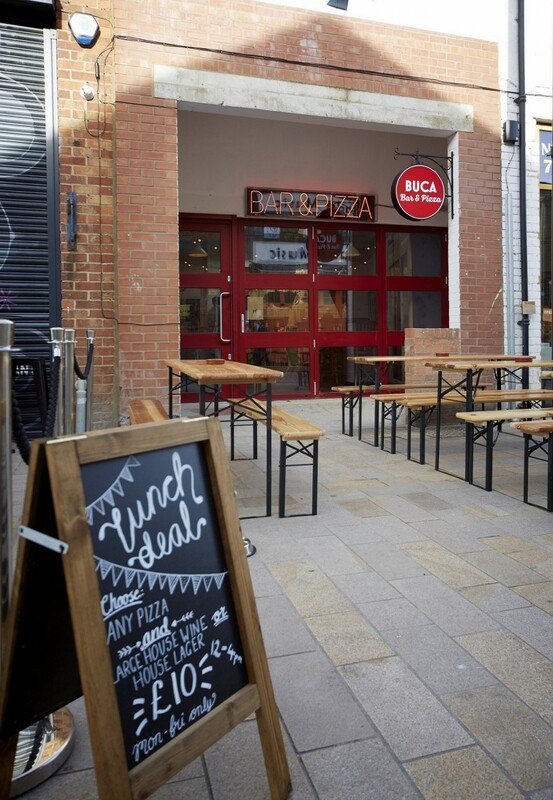 David Donkin, Property Director of Wykeland, speaking on behalf of Wykeland Beal, said: “We’re delighted to welcome Buca di Pizza to the Fruit Market, adding to the cluster of high-quality restaurants and bars that have brought such vitality and vibrancy to the Humber Street area. “As an independent and distinctive brand Buca di Pizza is a perfect fit for the area and will enhance further the appeal of the Fruit Market as a leisure location. Buca di Pizza is located between Ambiente Tapas and Cocoa Chocolatier and Patisserie in Humber Street and is open from 11.30am to 11pm Monday to Saturday and 12pm-10pm on Sundays. Head Chef Tom Lynch prepares mouth-watering meals for Buca di Pizza diners. 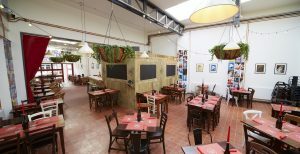 Buca di Pizza’s owners have invested £175,000 converting a former fruit and veg warehouse into the Fruit Market’s latest distinctive dining venue. The formal dining area at Buca di Pizza, which has opened in Humber Street in the heart of the Fruit Market. The opening of Buca di Pizza has created 15 full-time and part-time jobs. Buca di Pizza team members, from left, Waitress Charlotte Harrington, Head Chef Tom Lynch, Supervisor Kerrie Marsh and Chef Aaron Crossland outside the new pizzeria and bar in Hull’s Fruit Market.